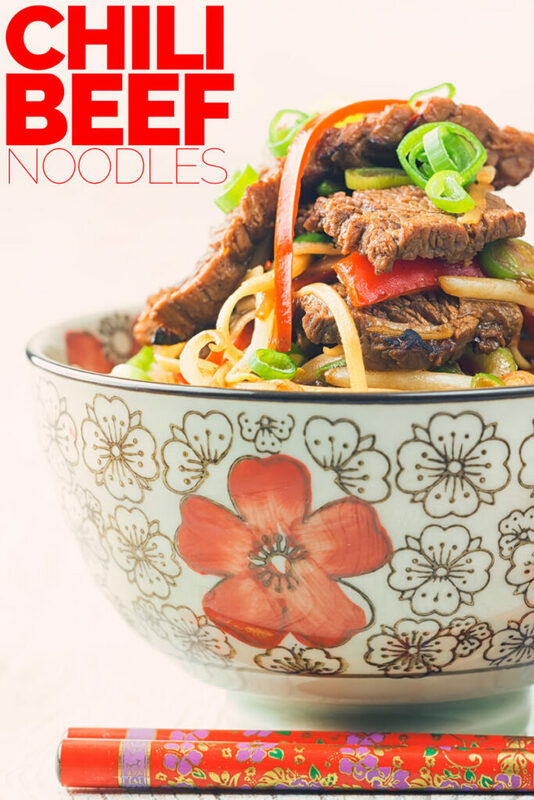 This beef and noodles recipe features some classic drag race style cooking! 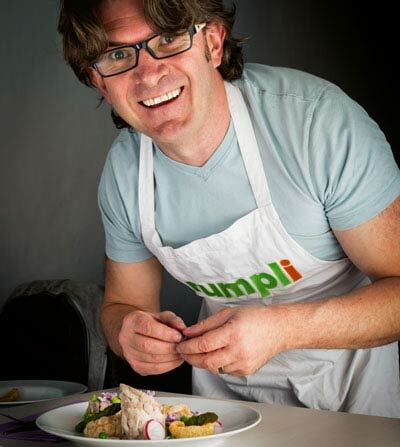 All of the work is in the methodical preparation and when you start cooking it is all about head down speed. This amazing stir fry cooks in just 10 minutes. 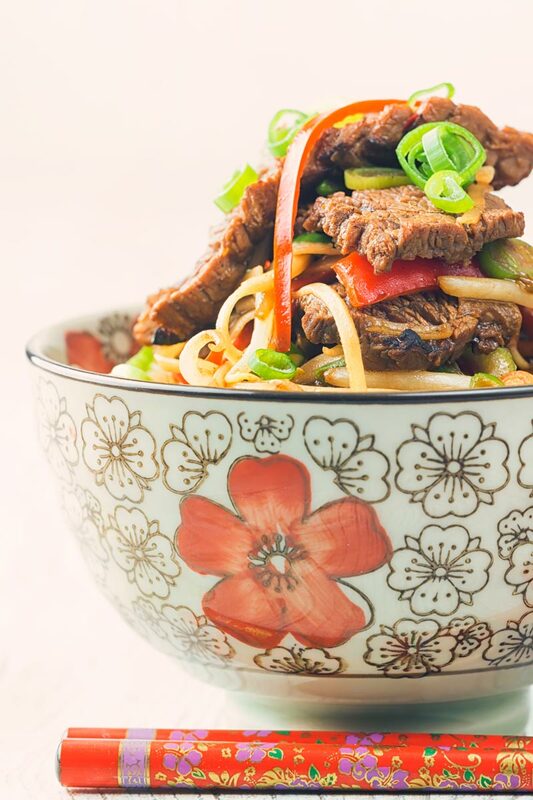 Stir-Fried Chili Beef and Noodles. 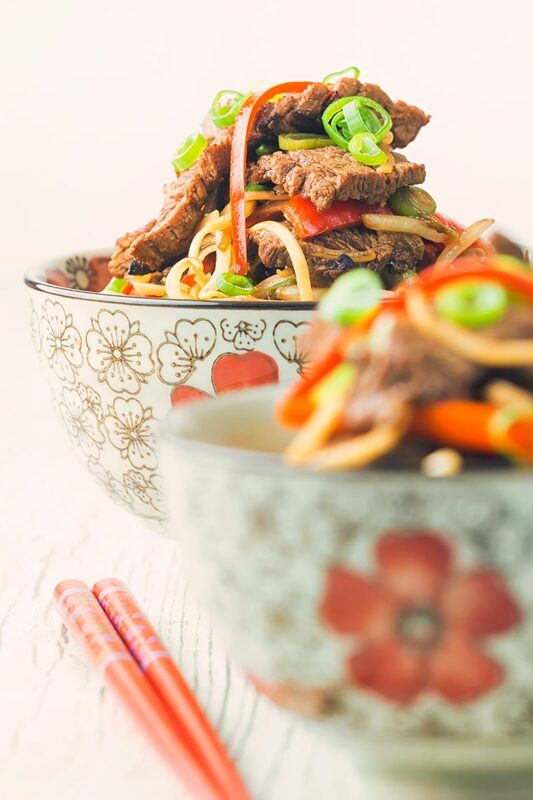 This stir-fried beef recipe is very much a simplified and lightened version of my sticky chili beef recipe. That one is a recipe that you need to lie down after. This is very different, it is light and breezy but does not lack for flavour. Cooked in the main with store cupboard ingredients this recipe is one that also requires little planning. It is also a rocket ship in the cooking department too. It takes just 20 minutes start to finish and only 10 minutes of that is cooking. 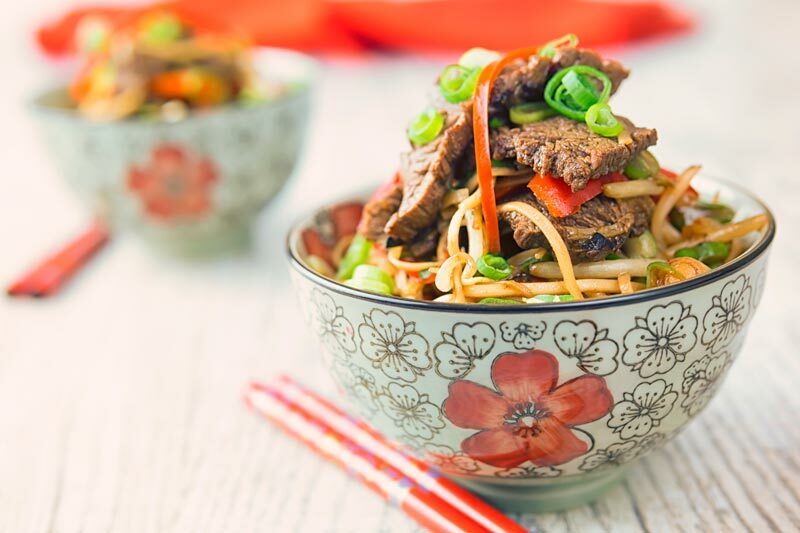 I personally favour sirloin steak in this beef and noodles recipe. In fact, I prefer it in all of my beef stir fry recipes. It cooks plenty quick enough, it is a tender cut of meat but it also has great flavour. You can also use something like skirt or flank steak. Flank is less tough but does not have as much flavour as skirt. Whatever beef you use make sure you cut it across the grain. 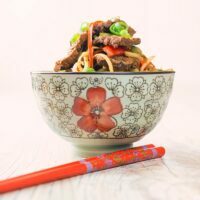 I talk about that a little more in this beef stir fry with shiitake mushroom recipe, so I will not repeat myself. Egg Noodles vs Rice Noodles. I always use egg noodles in my noodle recipes. That does not mean that you cannot swap the two of them out if you wish. The difference between egg noodles and rice noodles is what they are made of… Stating the obvious hey! Anyway, rice noodles are made of rice and water, egg noodles are made from egg and wheat flour. I personally prefer egg noodles as I find the texture more pleasing to eat. The gluten in the wheat flour gives them a bit more of a ‘bite’ texture. Egg noodles just need soaking in boiling water until al dente. When using them in a stir fry I do this in advance and then refresh in cold water before stir frying. For a salad like this Asian smoked mackerel noodle salad, you can either serve cold or reheat in hot water. Rice noodles need soaking in cold water until they soften and then need plunging in boiling water for seconds to heat them up. 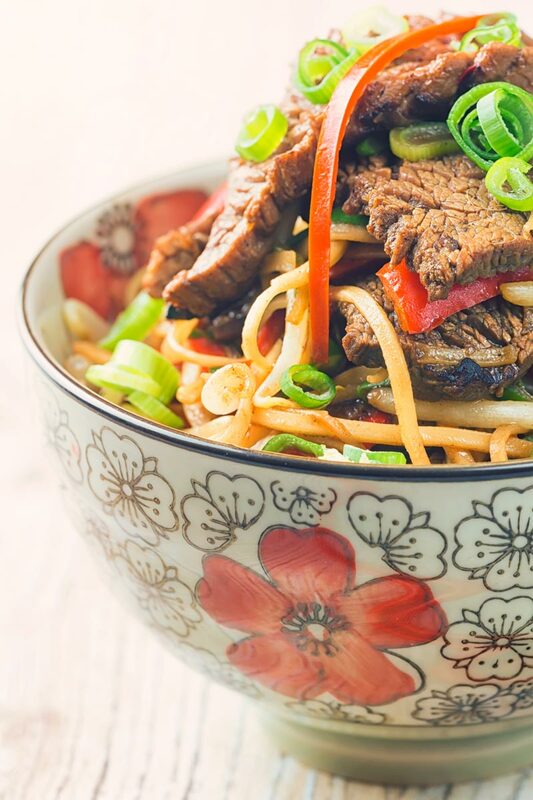 It's hard to get more classic stir fry fakeaway than beef and noodles... This version goes spicy with a sweet chili sauce based recipe that tastes divine and cooks in less than 20 minutes! Cook the egg noodles as per the instructions and then refresh in ice cold water. Thinly slice the garlic and cut the ginger into batons. Mix together the sweet chili sauce, soy sauce and the ginger and garlic. Add the beef to this mix and then allow it to marinade whilst you prepare the remaining ingredients and deal with the noodles. Slice the chili peppers into thin strands. Slice the pepper into strips 1 cm wide and 4 cm long. Take the spring onions and slice the white parts into 1cm lengths and the green part finely. Heat a wok over a fierce heat and when shimmering add the oil. Then in with the beef and stir fry for 3-4 minutes. Throw in the red pepper, chili and white bits of the spring onion and stir fry for 1 minute. Next up are the noodles in they go and stir fry for 30-45 seconds. Finally in we go with the bean sprouts and most of the green parts of the spring onion, reserve a couple of tablespoons to garnish. Serve in bowls with the remaining spring onions and an optional drizzle of toasted sesame oil. Don't get your hot red chili peppers confused with your red hot chili peppers, it would be a real 'flea' in the ointment! A beautiful light dish to have, it looks like it is very easy and quick to put together. Love the flavours and I cannot wait to make it. Week night drag race cooking is right up my alley! (or around my track! lol) This looks awesome. You sold me on the egg noodles. Thanks for sharing! This looks so flavorful and packed with veges! I can’t wait to try it! Stir fries are my absolute favorite! Pile it on! This Asian noodle dish works for me! Can’t wait to dig in! This sounds delicious – love how quickly it comes together with plenty flavor but not too heavy. Thanks Caroline, it is aimed at being a little lighter and fresher, but you are right, it is no slouch in the flavour department! I could go for a big bowl of this right now! Thanks for sharing.